In its ruling, the ECJ said that a service whose purpose was "to connect, by means of a smartphone application and for remuneration, non-professional drivers using their own vehicle with persons who wish to make urban journeys" must be classified as "a service in the field of transport" in EU law. It added: "As EU law currently stands, it is for the member states to regulate the conditions under which such services are to be provided in conformity with the general rules of the treaty on the functioning of the EU." Since Uber was first launched less than a decade ago, it has repeatedly fallen foul of regulators in different countries - and has frequently been forced to change its business model as a result. This ruling sets out clearly that Uber is, in legal terms at least, a transport company. 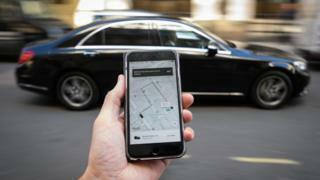 Uber itself insists that there won't be a huge immediate impact on its business, but it could still affect how it operates in future and how it liaises with national governments. That could ultimately have an impact, not just on ride-hailing services, but on other gig economy services - such as couriers and accommodation providers - who operate a similar model. TUC general secretary Frances O'Grady said the verdict meant Uber must "play by the same rules as everybody else". She added: "Their drivers are not commodities. They deserve at the very least the minimum wage and holiday pay. "Advances in technology should be used to make work better, not to return to the type of working practices we thought we'd seen the back of decades ago." Uber's presence around the world has often been controversial, with protests staged against it in various cities. "Millions of people use these ride-hailing apps every day - not just Uber, but dozens of others too. They have brought real benefits, making it cheaper, easier and more convenient to get around the city," he told Radio 4's Today programme. "There has also been a benefit in incumbent London taxi cabs, which are now taking credit cards, which they resisted for years. That is a response to competition." "There could be big implications for a sharing economy service like Airbnb, which will probably be regulated by the EU," he said. "What is fascinating about this right now is that different countries are taking very different views. Portugal has legalised Uber and Airbnb, whereas France is clamping down." Prof Andre Spicer, from the Cass Business School, welcomed the ruling. He told Today: "Many people see the EU is actually leading the way in pushing back the almost unlimited power of tech firms and beginning to provide some limits around that. "We also claim this fosters competition, but what Uber's model is based on is pricing, so much that they basically drove everyone else out of the market. "This judgement will allow normal competition, so what we will see is lots of other smaller apps appearing around Europe."